The Dovo Shavette is a razor that takes replaceable blades. It has the style of a straight razor in that it folds out. 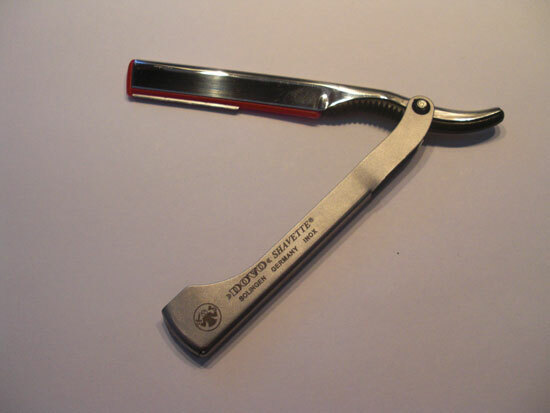 It also feels a lot like a straight razor while you are shaving with it, except that it is lighter. It is made by Dovo which is a German company. It has three different colors of inserts: red, green, and black. 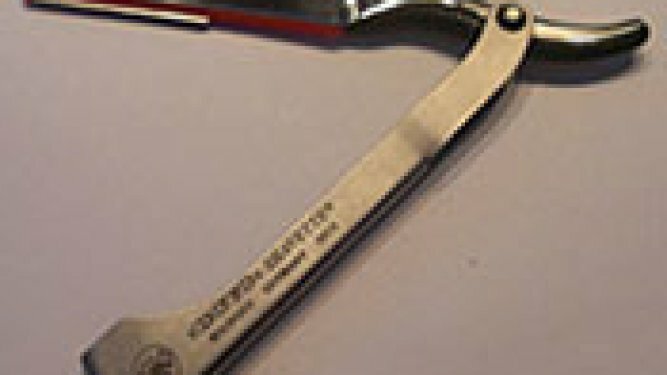 The red insert takes one half of a DE blade. There are lots of DE blade brands to choose from. The green insert takes a Personna hair shaper blade. The black insert takes the Dovo long blades. When you buy a Dovo Shavette it will typically come with the red insert and you have to buy the other inserts separately. 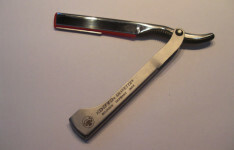 A big draw to the Dovo Shavette are the cheap cost of blades. Shavettes take DE blades that have been snapped in half. You can find DE blades all day long that come out to a cost of anywhere from 20 to 40 cents per blade. I even came across some blades that amounted to 4 cents a blade that were selling in a pack of 100. At that cost if you shaved every day and used a new blade everyday your total cost for the year in razor blades would be $14.60! The blades for the black and green inserts are a little more expensive. Typically, these will cost you around a $1 per blade. A lot of people like these because they are longer and as a result can cover more area with each pass. Even though you get the feel of a straight razor shave with a Dovo Shavette you don’t have to do any of the maintenance that a straight razor requires. No stropping, no honing and no worrying about the blade rusting. All you have to do is pop a new blade in and you are ready to shave. There is a slight learning curve when you use a shavette. The reason for this is because you have to gain the motor memory in order to shave your face. You have to learn the correct angle to hold the razor in order to cut the hair and not your face. Sharp blades are a good thing. You need a sharp blade in order to cut through hair. However since the blades are really sharp it is really easy to nick yourself particularly if you are in the process of learning how to use a shavette. Overall, I think the Dovo Shavette is one of the best, if not the best, razor out there when you factor everything together. You can get a great shave with its sharp, inexpensive blades. You don’t have to worry about maintenance like you do with a straight razor. The cons of shaving with one, the sharp blades and learning curve, will go away with practice and experience. is the first really helpful one showing the correct angles of attack,and direction and an honest appraisal of a well regarded tool by professionals and the learning curve neaded to use one well. Super instruction,should be shown in schools,a lot of teenagers have shown an interest to me,one today in Waitrose a boy serving,i gabbled out some information regarding setting the beval on a straight with all the false positives untill you get there,lots of unhelpfull stuff on the web,i had to find out by trial and error ok now ,i ended up advising him on a dovo shavette to get started and the short strokes,skin stretching with alum bar needed i advised mitchels wool fat,but even that has a learning curve,lot of stuff to pick up even more difficult to explain,unless you are a teacher or a barrister. Thank you for your kind comments. I do my best to point out the little details that make a world of difference when you are trying to learn how to shave with a shavette. I feel obligated to point out that there is a learning curve. My theory is that if you warn someone ahead of time that there is a learning curve and it may take sometime to learn how to shave, then they are going to be more likely to stick with it than if you don’t warn them. I feel like if I don’t warn people they might give up on it too early and not experience the satisfaction that shaving with shavettes and straight razors can bring. Next: Would It Be Good To Use a Shavette as a Starting Straight Razor?